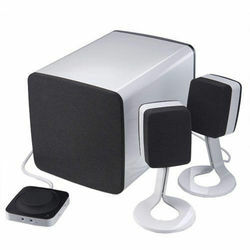 Transform your PC into a high-end audio system with the Dell AY410 Multimedia Speaker System. With these speakers, Dell offers a true upgrade in audio quality, speaker aesthetics and functionality. It delivers up to 33 Watts of power. Whether you''re enjoying the latest DVD movie, listening to music or playing an action-packed game, you will be at the center of excellent sound. This product has been tested and validated on Dell systems. It is supported by Dell Technical Support when used with a Dell system.